Big Switch Networks – Why SDN Fabrics? All of the presentations were awesome and well worth your time especially if you’re new to their products. As you can see, each component of a standard data center chassis switch has a similar component in the Big Cloud Fabric. 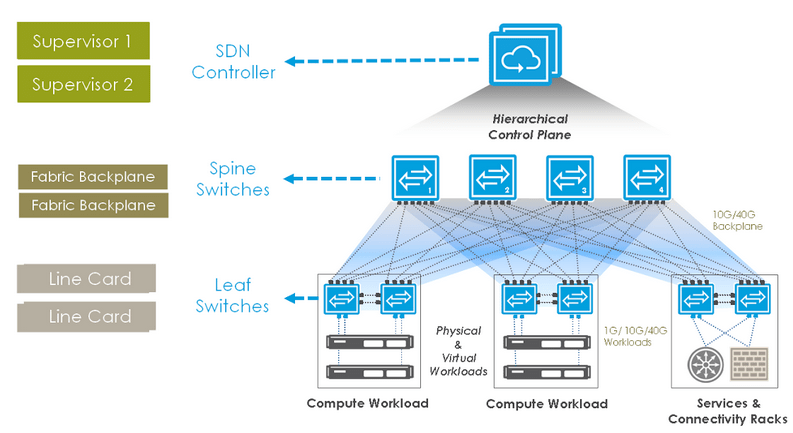 Leaf switches are the new line cards, spine switches the fabric modules or backplane, and the Big Cloud controller is the supervisor. Big switch then uses a standard IP management network to connect all of their components together. This isn’t a very big leap to make as most chassis based switches actually have an out of band Ethernet bus that’s used to communicate with all of the chassis components. Disaggregating them and having them talk to each other over a management network isn’t that big of a change. So what’s so special about Big Cloud Fabric? While the majority of new data center network builds are predicated on a leaf and spine design, we’re still doing all the switch configuration manually. Adding a new VLAN or VRF to the fabric means touching a lot of switches. Big Switch takes care of that for you by eliminating switch by switch configuration. With their software on each switch, and the Big Cloud Controller managing the switches, configuration changes are done from a single controller. Not only does this make things a whole heck of a lot easier, it also helps eliminate configuration inconsistencies. In addition to managing physical switches, Big Switch can now also control virtual switches in a KVM environment. One of the things I really appreciated about the Big Switch presentation was the sizing discussion. While some vendors like to talk about how large they can scale, Big Switch seems pretty content keeping their fabric reasonably sized. Their fabric is sized for 16 fully redundant racks encompassing 40 devices(32 leaf switches, 2-6 spines, and 2 controllers). They also acknowledged that making this any larger might be making your ‘splash zone’ (read failure domain) too large. I would agree on this point and much rather have smaller (to be clear 16 racks isn’t small) managed zones than put all my eggs in one basket. I also appreciated the discussion around upgrades and actual real world testing. The fabric is built with the ability to do hitless upgrades. This is premised off of having redundant leaf switches in each cabinet and driven totally from the controller point of view. They’ve also done quite extensive resiliency testing on the fabric. Implementing a network version of Chaos Monkey they performed switch failovers every 8 seconds and link failures every 4 seconds across the fabric. This testing showed no perceivable degradation of service across the network as the test was being completed. That’s a pretty big claim to make and one that should certainly draw some attention. All in all I came away from the videos impressed. The product is constantly evolving and I thought they were really focusing on the right areas. Adding the ability to span any port to any port with Fabric span is an obvious win and something that’s very much needed in today’s network fabrics. I also liked to see that they were integrating open source tools like Elastic Search rather than spend the time building their own.